Just want to know what your experience is on this matter. The FDA stated that "Special Considerations: Applicants may consider using a reference-scaled average bioequivalence approach for x drug. If using this approach, the applicant should provide evidence of high variability (i.e., within-subject variability ≥30%) in bioequivalence parameters. Applicants who would like to use this approach are encouraged to submit a protocol for review by the Division of Bioequivalence in the Office of Generic Drugs." This isn' the answer, but just a view. » That's valid, but if you are not really sure if you are just "borderline" then the additional overhead associated with the replicated design may not be worth it. You find an intra-CVR of 31%, and you scale the limits a wee bit etc. But the price you paid for this moderate scaling option could be much higher than you'd be paying for a conventional 222BE trial with a few extra volunteers. I lean towards John’s idea. Say you estimated the 31% from a previous 2×2×2 study in 40 subjects and assume that CVwR=CVwT=CVw. The 95% CI of the CV is 25.1–40.6%. Hence, in the best case (high CVwR) the FDA’s implied BE-limits would be 70.58–141.69%. That’s rather substantial. Some ideas: The number of treatments in a 2×2×4 study is roughly the same as in a 2×2×2 study – if we don’t plan for reference-scaling (which I likely would do in a borderline case). Subjects’ remuneration (though higher for the individuals due to more samples, extended hospitalization). Analytics (not necessarily: Roughly the same number of samples but might take longer if a batch size exceeds a working day). I would not be worried about the higher chance of dropouts in the replicate study. The impact on power is low (unless the drug is nasty and dropouts are caused by AEs). Calculation of costs is complicated (fixed & variable costs, blahblah). In my CRO we had a spreadsheet with 100 rows… Had a quick look (19 samples / period, last sampling 16 hours; 2×2×2 in 42 subjects vs. 2×2×4 in 22). The replicate design would be ~4% cheaper. If you hope for RSABE (for CVwR 31% 18 subjects instead of 22 for ABE) the reduction in costs would be ~12%. We were able to get more than 4% discount for replicate versus equivalent '2x2'. We would rather do replicate study instead of large '2x2' with 2 or more groups due to the capacity of the clinic (if wash-out is not long). For your calculation please keep in mind: the more study periods you have the higher the risk of drop outs. » For your calculation please keep in mind: the more study periods you have the higher the risk of drop outs. » » I would not be worried about the higher chance of dropouts in the replicate study. The impact on power is low (unless the drug is nasty and dropouts are caused by AEs). # Study started with 42 subjects (expected power 81.1%). # Study ended with 39 eligible subjects (expected power 79.2%). # Study started with 22 subjects (expected power 83.3%). # Study ended with 18 eligible subjects (expected power 75.1%). Don't confuse the usage of "expected power" here by Helmut with the functions in package PowerTOST which estimate the expected power and / or sample size based on expected power, some sort of Bayesian power, taking into account the uncertainty of an observed point estimate of T vs. R and / or the uncertainty of an observed CV. See f.i. ?exppower.TOST and references given in that man page. » Calculation of costs is complicated (fixed & variable costs, blahblah). In my CRO we had a spreadsheet with 100 rows… Had a quick look (19 samples / period, last sampling 16 hours; 2×2×2 in 42 subjects vs. 2×2×4 in 22). The replicate design would be ~4% cheaper. If you hope for RSABE (for CVwR 31% 18 subjects instead of 22 for ABE) the reduction in costs would be ~12%. Can you please help me for in the approximate estimation of cost of bioequivalence study?, would you please send me the template sheet that you use for such calculations. » my question about the ethical view of such approach vs sponsor risk due to inadequate design? There is an exception: If you suspect an HVD(P) you should perform the pilot study in a replicate design to get an estimate of CVwR (and CVwT in the full replicates) which is needed for estimating the sample size of the pivotal study. If the pilot study was a simple crossover you have to assume that CVw = CVwR = CVwT, which might be false. For borderline cases (no reference-scaling intended but one suspects that the CV might be higher than assumed) a Two-Stage Design can be a good alternative. A while ago I reviewed a manuscript exploring the pros and cons of TSDs vs. ABEL. Was very interesting and I hope that the authors submit a revised MS soon. “Just in case” never works. Exactly. You have to state in the protocol that you intend reference-scaling. Furthermore, you have to give a justification that the widened acceptance range for Cmax is of no clinical relevance. IMHO, that’s bizarre (the FDA for good reasons doesn’t require it). HVD(P)s are safe and efficacious despite their high variability since their dose-response curves are flat. The fact that the originator’s drug was approved (no problems in phase III) and is on the market for years demonstrates that there are no safety/efficacy issues. It doesn’t work that way. State in the protocol that you intent to scale and follow the EMA’s conditions. If CVwR ≤30% don’t scale or apply ABEL otherwise. » why the need for the extra periods/dosing of volunteers from ethical/scientific view? For the decision (ABE or ABEL) based on CVwR a replicate design is required. » » while ago I reviewed a manuscript exploring the pros and cons of TSDs vs. ABEL. Was very interesting and I hope that the authors submit a revised MS soon. » Can i get the link or the name of the paper when the authors submit it ? If the revised MS will get accepted and published, for sure. » In General, if a drug isn't known to be HVDP and by definition of HVDP that, they have wide therapeutic index yet the CRO/Sponsor went with replicate design. Any replicate design can be assessed for conventional ABE. If the sponsor intends to try RSABE it has to be stated in the protocol. Might be worthwhile in borderline cases (CVwR ~30%). » How the assessor would consider that? mean if the published literature or pilot study suggest low CV of the reference /test product yet the cro/sponsor went with replicate design? I think you are mixing two things up. Replicate designs are applicable for ABE as well. If the sponsor aims for RSABE – in contrary to data in the public domain (few exist!) which suggests low variability – as a regulator I would be cautious. Note that regulators see a lot of studies. Was the CVwR caused by poor study conduct? That’s a gray zone. 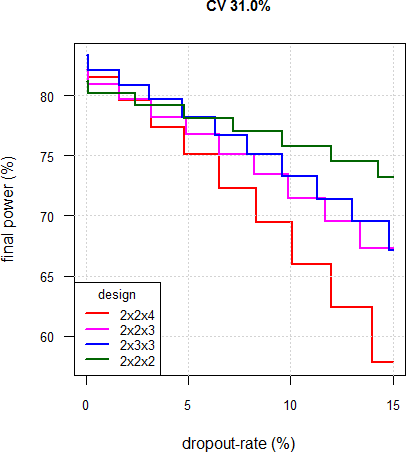 design <- "2x2x4" # any of "2x2x4", "2x2x3, "2x3x3"
Might be highly variable, right? » Like abusing the use of scABE ? » Agree, yet i read an ANDA submission -can't find the link now- where the sponsor detected outliers based on T/R ratio of each subject and redosing of such subjects along with other subjects who exhibited normal pkp profile; though it was after reviewing with FDA regulator. Yes, that’s an old story (“re-dose the suspected outliers – both with T and R – together with at least five ‘normal’ subjects or 20% of the sample size, whichever is larger”). IMHO, the individual T/R-ratios are not a particularly good idea for assessing outliers (ignoring period effects). Highly variable like all bisposphonates. Can’t reproduce the estimated sample. I got 132 and not 138. » … the sponsor/CRO stated the definition of outliers using studentized residuals and boxplot to eliminate subjects with values away from the boxplot by more than 3 IQR. Not surprising since Susana Almeida was co-chair of the Bioequivalence Working Group, European Generic and Biosimilar Medicines Association (EGA). At the joint EGA/EMA workshop (London, June 2010) I – as a joke! – suggested boxplots, which are nonparametric by nature. The EMA hates nonparametric statistics. But the panelists welcomed the “idea” and my joke made it to the Q&A document. My fault. Never presume humor. Now it’s carved in stone. This study demonstrated why not accepting reference-scaling for AUC might not be a good idea. Since the sample size is based on AUC, products with extreme T/R-ratios of Cmax would pass ABEL due to the high sample size. Given the results of this study: 90% chance to pass with T/R as low as 84.46% or 80% chance to pass with T/R 82.95%. Technically (i.e., according to the GL) nothing speaks against that. But do we want such products on the market? BTW, for the FDA the study could have been performed in just 45 (!) subjects – without risking extreme Cmax-ratios. » My point is, as your kindly said, it's best to state in the protocol how to deal with outliers especially regarding variability estimation and proving/showing to the assessor the reasons for excluding such outlier(s) from study or reviewing it with the regulator before submission of the data? Thanks alot for your time and explanation. » For the sake of curiosity, in your opinion should a regulator approve a generic submited as "highly variable" although all the previous trials reported low CV's? Technically, the criteria are well defined and no objection should be raised in principle. However, should a study that reports an high variation, when all the previous information reports otherwise, be considered scientifically sound for the demonstration of bioequivalence? Is the high variability enough to trigger an inspection? Likely. See Section 2 of the EMA’s CMDh Guidance on triggers for inspections of bioequivalence trials: Quick scan. conflicting results between studies regarding pharmacokinetic parameters or overall/intra-subject variability. Although response to these questions may not always be easily found, the issues raised should be taken seriously. Issues should generally be judged based on proper knowledge on bioequivalence testing methodologies. In case it is known, the conduct and outcome of the study may be compared with previous studies in order to check for potential issues. Can an inspection reveal bad study conduct increasing the variability? Possibly not. Regulators should assess studies based on the “whole body of evidence”. Would an assessor have the guts to reject an application without relevant findings in an inspection and risk to be overruled by the CHMP in a referral? Duno. As intra-subject variability of the reference product has not been reviewed to elaborate this product-specific bioequivalence guideline, it is not possible to recommend at this stage the use of a replicate design to demonstrate high intra-subject variability and widen the acceptance range of Cmax. If high intra-individual variability (CVintra > 30 %) is expected, the applicants might follow respective guideline recommendations. The CV we observe is influenced by bioanalytical variability and possibly by factors noone understands well. For example, it has not -to the best of my knowledge- been much studied if certain populations are more within-variable than others. It is in my opinion entirely likely that if we go about studying a drug product in different places we will observe different CV's for some reason or other or by chance, even if we take great care with our experiment. Of course assessments should reflect the applicant's observations. Additional factors to consider: With time assays often get better, by and large - a CV obtained from a CRO using the API3000 10 years ago is in my opinion likely to be higher than if it were obatined today with an API6500 due to S:N phenomena (but I am not implying anything about "how much"), all other factors equal. CV for Cmax (possibly also CV for AUC) may perhaps only be justifiably compared if the time points for blood sampling are the same (they rarely are between studies). They already did that in the general guideline. Those with an observed CV above 30%. Simple as that. But you are right, some degree of common sense is also necessary. If you have 20 reports with a CV of 11% and one with a CV of 41% then you start wondering. A few aberrant subject T/R's can easily inflate a CV, whether they occur by chance or not. This is the sort of thing that is not covered by much literature and probably won't be for another 20 years?! » ...If you have 20 reports with a CV of 11% and one with a CV of 41% then you start wondering. OK, and (as a regulator) what are the options? Start an inspection of the CRO? Find some other "good reason" not to grant MA to the pile of trash high quality generic developed in a scientifically advanced pharmaceutical company with cutting edge technology? - effects are not random. Did some sims in the old daysTM, effect of assay when validated according to current recommendations is negligible. Especially for the "11% CV in 5 other trials, suddenly 40% in my trial" example there is no explanation remotely related to assay. It would be interesting to study the within study variation for the same compound in the same unit to understand which is the main source of variability. Although I understand the point of El Maestro about assay sensitivity, I don't think that could be pointed as a cause for a study which presented high variability when other studies reported low variability. I understand the approach to highly variable drugs, when the drug is actually highly variable per se and not due to study conduct or assay sensibility. » It would be interesting to study the within study variation for the same compound in the same unit to understand which is the main source of variability. Although I understand the point of El Maestro about assay sensitivity, I don't think that could be pointed as a cause for a study which presented high variability when other studies reported low variability. I understand the approach to highly variable drugs, when the drug is actually highly variable per se and not due to study conduct or assay sensibility. Then it all comes back to one of Helmut's favourite hobbies, calculation of confidence intervals for variabilities. I think the conclusion generally is that perhaps the drug is highly variable and perhaps it isn't. Recently we did pilot and pivotal (Partial reference replicate) studies for WHO and we got high variability (CV=32%). In the USFDA product specific guidance they have suggested 2x2 crossover design for this drug. Based on our prior experience can we perform reference replicate study or need to go as per guidance? » Recently we did pilot and pivotal (Partial reference replicate) studies for WHO and we got high variability (CV=32%). In the USFDA product specific guidance they have suggested 2x2 crossover design for this drug. Based on our prior experience can we perform reference replicate study or need to go as per guidance? You probably have both options available. However, the gain with CV=32% is minute; I mean if you have a CVr of 32% in a replicate study you are widening the limits so minutely that I think it isn't worth the effort. At the end of the day those (semi)replicated are still far less routine than the standard 222BE jobs. And IEC's can have a lot of funny ideas when they review your protocol etc.